So I just bought a Yelp deal that is going to get me $30 worth of tapas at Lalola on Nob Hill for $15. Needless to say I am very excited, especially because someone there evidently has connections to one of my favorite tapas places in Madrid, Txirimiri. I also stumbled upon a guide for a San Francisco tapeo through an area not too far from my house…might have to do some investigating!! The name of this tapas bar looks a little crazy, but the pronunciation is quite simple: “cheery-meery.” Txirimiri is a Basque word for something they are very familiar with in the region; rain. One of my students from a private lesson told me that txirimiri is a very specific, very fine type of rain that is super characteristic of the Basque Country. If it’s anything like the fine, misty, blow-under-your-umbrella-into-your-face rain that I am thinking of, it sounds absolutely horrible. But, we are not talking horrible rain here, we are talking delicious food, and I found plenty of it at Txirimiri. 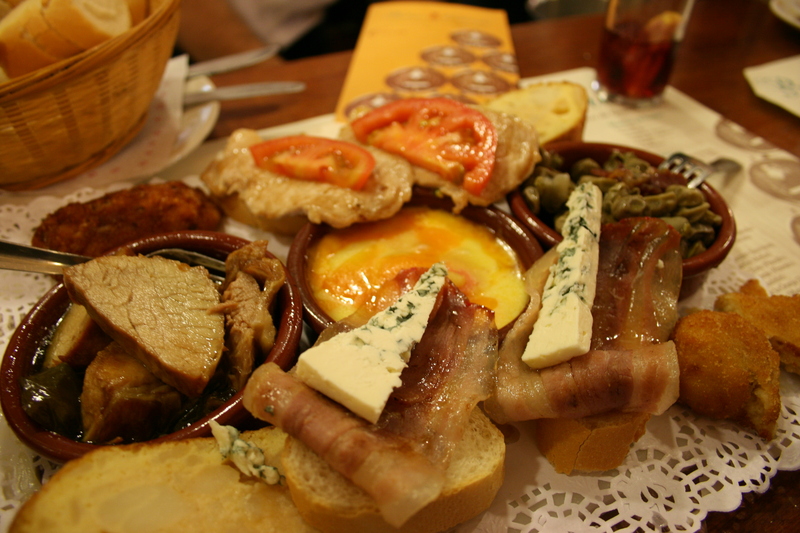 Since it’s a Basque restaurant, the tapas are called “pintxos” (pronounced “peenchos”) and are usually sitting on a piece of sliced baguette. We sampled a few things and they were all delicious, but the servings were so huge and awesome that we stopped ourselves early because we were sure we had spent a million euros. We started with a pintxo of eggplant (aubergine) which was battered in tempura and placed on top of a pile of unidentifiable but absolutely delicious something. I think it involved caramelized onions and peppers and maybe some cod? I have no idea. It was dark, and I was hungry. But the thing was huge, and it cost two euros!! Heaven. Mid-pintxo we saw a big piece of grilled steak floating by on a plate and pointed and ordered one for ourselves without really hearing what it was or how much it cost. It ended up being “entrecot de ternera” with soft red peppers and a creamy garlic sauce, one of the day’s specials. It was honestly the second best piece of steak I have ever had, beat only by the Basque masterpiece I experienced in Barcelona. It was called a “tapa” but was honestly big enough to be a light dinner in itself. The cost? It ended up being 4.90, not the 18 euros we had hypothesized. We should have ordered three. Before we realized that our bill was shockingly small, we decided to tone things down a little and go for one more pintxo and then move on to somewhere else. Marshal chose the tortilla and I was going to smack him for picking something so boring and basic, but then I tried it and it was, of course, incredible. It was sweet or something, I think from the way they cooked the onions. Regardless, Marshal was right and I was wrong and we enjoyed the tortilla to the very end. When the bill came, we were honestly amazed: for the two pintxos and the plate of steak and three beers, we paid 13 euros. An amazing price for a ton of delicious, unique food. The bar was absolutely packed when we were there at 9:30. There is also a restaurant in the back if you prefer to eat sitting down at a table like a civilized person instead of battling your way to the bar and then ravenously scarfing down your food, plate in one hand, caña in the other, all the while watching your bag like a vulture to make sure that nothing disappears. But, if you don’t like that style of eating, maybe you shouldn’t eat out in Spain. c/ General Diaz Porlier, 91 (the original in Salamanca) and c/ Humilladero, 6 (the La Latina location near c/ Cava Baja).